Woohoo! I got 93 points from 99 on the Swedish test! I knew I did reasonably well, but I didn't expect this. I got some new research materials from Finland and among lots other cool stuff was a document that talked about braiding. Of course I had to doodle immediately. 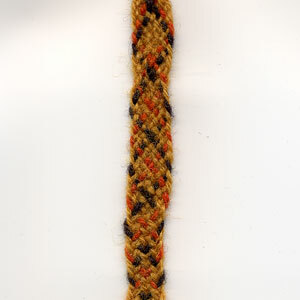 This techique was used by Estonian peasants to braid garters and belts in 19th century. I didn't know it is also a medieval technique. Way cool. I must find out if there are any finds from Estonia too.